Ethical or Out of Line? An effective social media strategy injects human blood into a brand and creates an opportunity for businesses to develop deep relationships with consumers. When done right, social media helps tell a story that consumers are happy to escape into. But when you don’t adhere to social media ethics, customers may see your brand as something to escape from. Take, for example, UK-based CelebBoutique’s newsjacking-gone-wrong in which they used the #Aurora Twitter hashtag to promote a “Kim Kardashian-inspired Aurora dress” when the hashtag was meant for content regarding the Aurora, Colorado shootings in July 2012 that left 12 people lifeless. In this situation, the backlash was more than just lost followers -- consumers boycotted the brand for the insensitive treatment of a serious issue. It is possible for brands to engage and entertain while remaining ethical, and here’s how. 1. Avoid controversial subjects like religion and politics. Businesses should leverage social media as a tool to humanize their brand and put a personal stamp on it with which people can connect. However, loaded subjects like religion and politics may offend some people, polarize customers and create the wrong kind of spotlight on your brand. It’s good to stir the pot sometimes, but choose your topics carefully. 2. Avoid libelous or defamatory comments. You are legally responsible for any statement made by you or your business, so be careful not to say anything intended to damage someone’s reputation because you will be held accountable. Because you’re now able to be a media outlet, you must operate under the same rules, and libel is a big no-no for journalists. Plus, it won’t do any good for your company to develop a reputation for bashing the reputations of others. 3. Understand and follow each network’s terms of service. As NPR’s guide says, it’s crucial to keep in mind the that a social media site’s terms of service apply to what information is posted and gathered from it. Did you know that Facebook’s terms of service regarding cover photos says, “Covers may not include images with more than 20% text,” or that Pinterest’s terms of service say that by using Pinterest, you grant Pinterest and its users a “non-exclusive, royalty-free, transferable, sublicensable, worldwide license to use, store, display, reproduce, re-pin, modify, create derivative works, perform, and distribute your User Content on Pinterest solely for the purposes of operating, developing, providing, and using the Pinterest Products”? Not only does it go against social media ethics to break the networks’ rules, it’s also bad for business if you get caught and shut down. This might sound like common sense, but how often do you encounter advertisements that make gross exaggerations about a company? 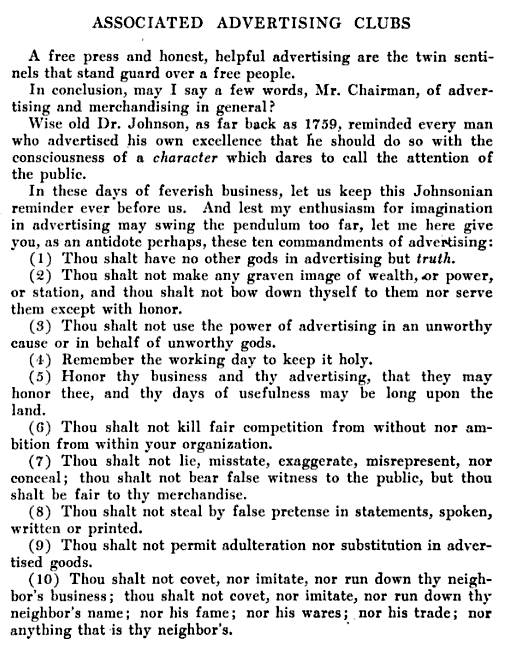 In 1911, the Associated Advertising Clubs of the World produced the “Ten Commandments of Ethical Advertising.” The first commandment? “Thou shalt have no other gods in advertising but truth.” If you use deceptive content to get people to your website, they’ll find out pretty quickly and it won’t benefit your business. Following those two words will help you stay within ethical boundaries on social media. An easy way to guide the content you share is by asking yourself, “Would I say this during a client meeting or networking event?” Ultimately, it comes down to putting yourself in the consumer’s shoes by understanding his or her buyer personas. Social media ethics is a complex subject that deserves deeper discussion, so please share your thoughts on the topic in the comments below!